Green screening also known as “chroma key” is a filming technology that is in charge for believable cosmic battles in Star Wars, gloom remnants of the human civilization in Terminator, and beautiful sea sunsets in Titanic. As computer performance progressed, the technology became available for home use too. Basically, green screening replaces some color of the original footage (usually, this color is green, that’s where the name comes from) with an arbitrary image, computer graphics or another footage. In SparkoCam software, the green screen option allows you to replace the background of your webcam video with any picture or even movie, so you can turn your room to a fantastic landscape, or move the action to Amazon jungles, or just replace a part of the background with additional graphic content. Now, all you need is a green background that you can buy in many photo supply stores around the web, and SparkoCam. Here is a step by step instruction on how to use green screen with a webcam. Run SparkoCam and switch to the Device tab. Put the checkmark near the Web Camera section to open it, and find your device in the dropdown list. You can configure your device by clicking the Properties button. 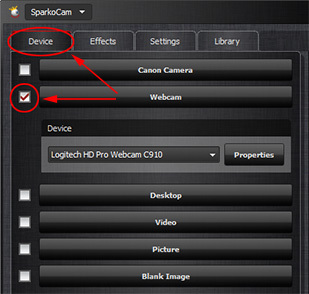 Note that you can use other devices as a source of the web camera footage as well. 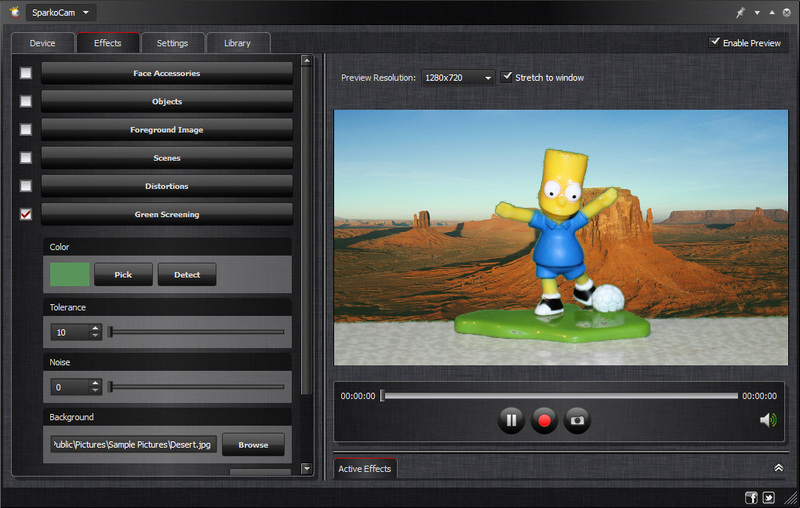 They include Canon DSLR cameras, a real-time video of your desktop, predefined video files or even a static image. Now you should specify the color you want to be replaced with the background image. You can either pick it from the preview window with the Pick button, or let the program Detect it automatically. You should select an image or video that will represent the new background of your camera picture. 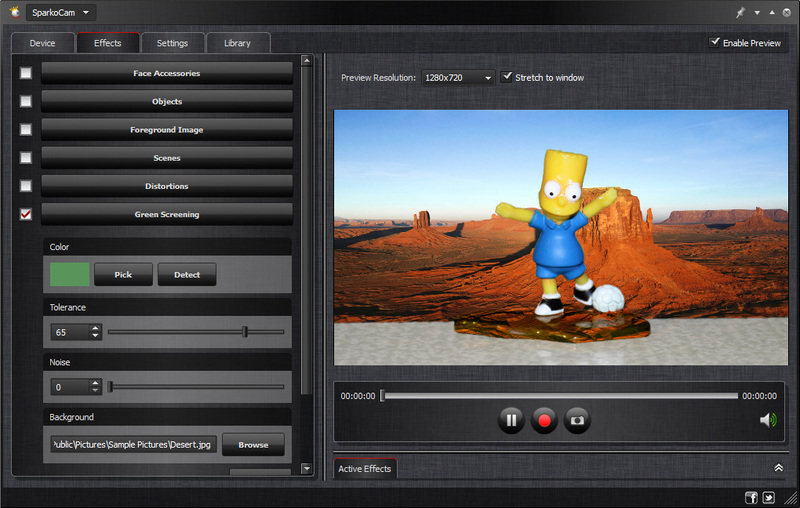 The Noise option allows you to take into account and compensate noise in the source footage caused by compression artifacts, antialiasing and other reasons. Here we go! 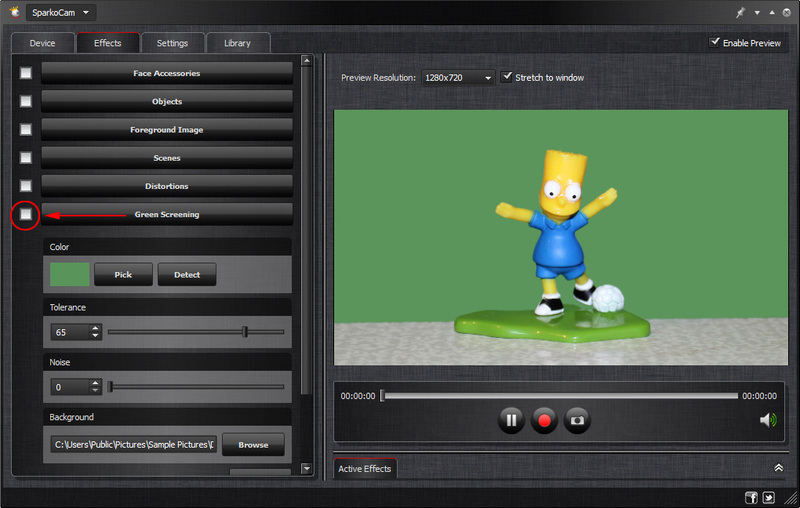 The virtual web camera powered by SparkoCam now transmits the actual footage with the background replaced thanks to green screening. This virtual device functions just like a normal web camera, so you can use it with Google Hangouts, Skype or other video chat applications.